Revesby brought the curtain down on their hugely successful 2016 season with a narrow four wicket win against Scothern on the final Sunday in September. Winning the toss, they elected to bowl first and, despite losing their talented young opener W. Bailey for 15, Scothern moved to 68 before a second wicket fell. J. (James) Drabble, as he had done in the corresponding fixture a few weeks ago, nearly reached 50 before being caught by W. Laird off the bowling of R. Knight for 47. Further wickets fell towards the end of the innings with the score going from 131-4 to 142-9 at the close. S. Norton was the other mainstay of the visitor’s innings, as he made a significant contribution of 31 from just 20 balls, before becoming one of D. Hunt’s four victims (4-20, all bowled and at one stage he was on a hat trick). R. Knight also finished with 4-54 to take him to 42 wickets for the season – a fantastic achievement and one that confirmed him as overall leading wicket taker across all five divisions. 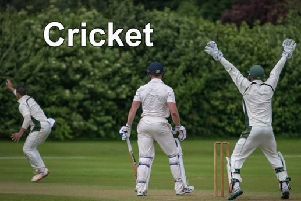 Chasing the intriguing and competitive target of 143, Revesby got off to a really poor start as they found themselves two wickets down for just two runs inside three overs, with J. Drabble striking on both occasions. Relative calm followed for the next 12 overs as the score moved to 43 before M. Twells (19) and W. Laird (21) were both dismissed in quick succession. When G. Lane (8) and C. Wall (5) followed soon after, the match was heavily weighted in Scothern’s favour, with the hosts on 63-6, still less than halfway towards the required total. J. Lewis took the attack to the Scothern bowlers with his highest score of the season ( a superb 49 not out which included five huge sixes), and together with R. Knight (23 not out), they put on an invaluable and swift 83 for the seventh wicket to guide Revesby to victory by four wickets, and with nearly 10 overs to spare. J. Drabble again led from the front by taking 3-25 for the visitors from his 10 overs of impressive seam bowling, with young B. Gregory taking 2-28 from an attacking and brave spell of spin bowling. A fine finale to the season closer which saw the 2016 Lincs League Division One champions pass the 250 point mark and finish with 12 wins from 14 games, topping the table by 42 points from runners-up Nettleham. The collective teamwork and togetherness, coupled with some individually outstanding performances, have been the key ingredients to the successes enjoyed during the season for the hosts. Next year will no doubt provide stiff and stern challenges with life in the Sunday Premier League, but ones that Revesby will embrace. Below is the final league table for the 2016 season, showing a 42 point margin for Revesby from nearest rivals Nettleham, who ended the season as runners-up.